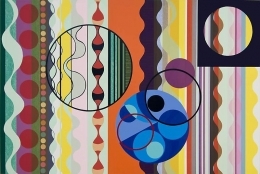 James Cohan Gallery is pleased to present a new suite of prints by renowned Brazilian artist, Beatriz Milhazes. The works will be on view at the gallery from April 1 – May 1, 2010. In September 2009, Beatriz Milhazes worked with Durham Press in Durham, Pennsylvania to create the Gold Rose Series, which is an edition of seven silkscreen and wood block prints. This series comprises two single panel pieces, a diptych and a triptych and is full of the vibrant color schemes, botanical forms, and intricate detailing typical to her work. Milhazes, who takes inspiration from the brilliant flora and fauna of Brazil, local folk arts, and Matisse's cut-out paper silhouettes, creates abstract works that exalt the beauty of the natural world. These new abstract works combine a vivid sub-tropical palette with sharper geometric forms to create an intense visual experience. In 2011, Beatriz Milhazes will be featured in a prominent solo exhibition at the Beyeler Foundation, Basel, Switzerland. Other recent and important solo exhibitions include; Cartier Foundation, Paris, France, 2009, and Pinacoteca do Estacao, São Paolo, Brazil, 2008. Milhazes has exhibited widely in museums around the world and has represented her country at the 50th Venice Biennale, 2003. She has participated in many international Biennale exhibitions including; Shanghai Biennale, 2006; XXVI Biennale of São Paolo, 2006 and 1998; the 11th Biennale of Sydney, 1998 and the Carnegie International, 1995. In 2010 she was given the Award of the Order of the Ipiranga, which is the highest civilian award in the state of São Paolo for her cultural contribution to the country. Milhazes was born in 1960 in Rio de Janiero, Brazil where lives and works today.